Oh yes, that person you don’t like: the professional organizer. Ok, I am not really a professional organizer, I just hate clutter so I am going crazy. I just love to organize and I love things that help you organize. 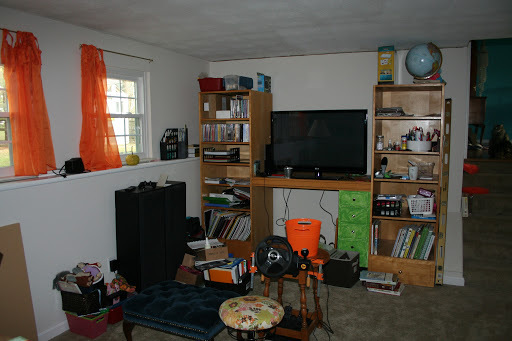 I really have to get rid of more stuff, and I had already donated tons of stuff before we left North Carolina, and I mean a lot of decor and bedding and books and kitchen stuff and clothes, and I think we have hundreds of dollars in donation write offs for tax season and do we need it. So I was going to up load pics of the school room in disaray but I can’t find my cord to the camera that attaches to the computer for uploading. eerrggggg. I was also going to upload a pic of poor lil’ Nessie’s staples in her little doxie tummy 😦 and her wearing her cone. Downsizing is the pits! 🙂 and its a good thing I have a sense of humor to get me through it all! UPDATE: I found the cord, in the drawer it was suppose to be in only it was buried under some stuff. 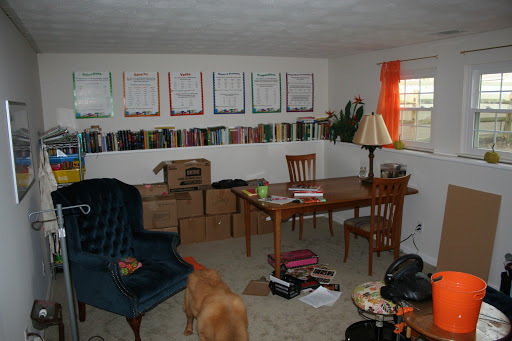 Here are the pics and the room is messy, but I did get the books unboxed but they are piled right were the boxes are. I am still not done organizing it. I organized the office/guest room last night. I will soon get to the school room. I have my main paint color sitting here, I just have to paint it and get the paint for the accent walls. Dede has said she wants to hand paint Hibiscus blooms on the wall so she is practicing drawing those. I can’t wait till its all done! Oh, isn’t it messy! But Kiki made sure she can get to the PS3 so she can do her driving and so both girls can play Sonic the Hedge Hog. lol! This entry was posted in Homeschooling, Photography, Quad Crashers. Bookmark the permalink.